This collection of frequently asked questions (FAQ) provides brief answers to many common questions about the Permanent Makeup procedure. 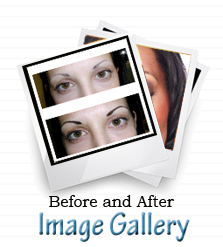 Permanent cosmetic makeup is a sophisticated micro-procedure known as cosmetic tattooing. Specially formulated colored pigments are deposited into the dermal layer of the skin. Aftercare and skin type determine the lasting visual results. Fading may occur and a refresher color may be desired after several years. The procedure takes about ninety minutes. How safe is permanent cosmetics? In most cases discomfort is at a minimum. With the use of extremely effective topical anesthetics, we can provide near total numbing of the area. What can I expect following a procedure? How many touch ups are required for desired results? Most people need one to two touch-ups for desired results. Thereafter, it's recommended to refresh once a year to maintain freshness. Is there any release or medical form to fill out? A medical form that includes a release clause will be faxed or e mailed to you. This must be signed before your actual procedure. Can you get laser work done after permanent cosmetics? Will the lip color bleed into the skin over years or will the color change and become unattractive? Can you get any infections in the lips or other areas that are tattooed?